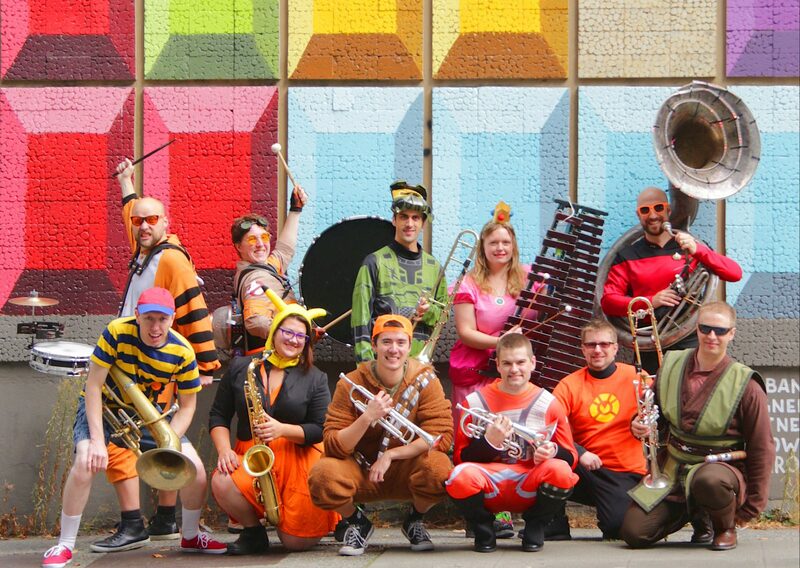 …are out to surprise and delight with the fun of live, nerdy music. …are flexible! We’ve played from stage to street corners and everywhere in between. …currently play music from sci-fi, cartoons, video games, movies, TV shows, and more! …look good! Cosplay with the best of them all while blowing some great tunes. …have been around since January 2017 and many members have been playing in brassy bands since well before that. …have a brass band and we’re not afraid to use it. …are goofy, upbeat, and nerdy. Our dream gigs include following cosplayers around with their theme songs, and a surprise party for Bill Nye. …are open, transparent, supportive, and democratic about band operations with our members. We exist because our members dedicate free time on top of day jobs and families to arrange, practice, come up with crazy ideas, teach each other, and work together to share our love of music. …experiment with new ideas, try new instruments, improv solos, and arrange themed sets we think sound cool. All our music is arranged by members and all members are highly encouraged to contribute creatively. …rehearse once a week and typically alternate weeks between required rehearsal and optional learning/improv/arranging etc. …read music. Our music is written down so new members, guest musicians, and fellow bands can easily join us. …strive to memorize music. We like to get into the audience and look cool and that can be hard with a lyre. Still, we may use music for those “wouldn’t-it-be-cool-if” crash sets, learning something new, and generally to set ourselves up for success. We’re here for our members and audience to have fun. Sound like you? Check our current openings for new members.